The new year is here and 2019 is the time for new resolutions. We all want our lives to be stress-free, happy and productive. We make health resolutions, financial resolutions but organizational resolutions usually don’t top the list. Organization is where you can start to put all your plans into focus. 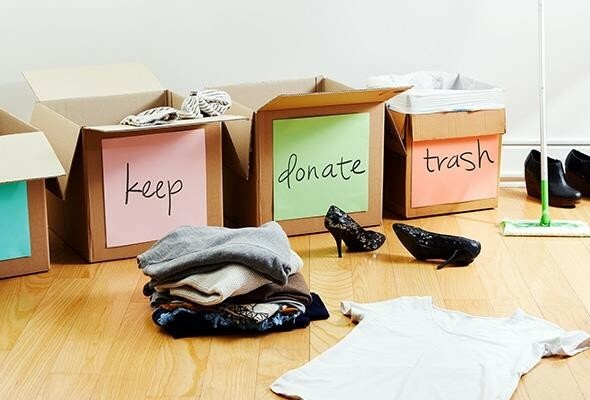 Organize your house or your business and begin to alleviate some of the clutter that is messing up your fresh start. We here at Green Storage, have put together a few tips to help you embark on operation organization. The amount of clutter that is generated by paper and disc media can be quite considerable. As we strive for the streamlined life, holding onto mass amounts of books, that are only a ‘one read’ type, and magazines consume a vast amount of prime storage space. We all have those books that are a ‘must-keep’ but with the use of tablets, Kindles and the like, your library can become extremely condensed and very portable. Magazines have a lot of great and creative information, not to mention recipes, that we love to hang on to. Why not scan these articles and have them only a click away? DVD’s and old VCR tapes can be converted to a digital format that can be stored easily on an external storage, like a hard drive or even a USB stick. This will allow you to have your movies at your fingertips. We all have the urge to buy, whether it is necessities or luxuries. This is not a problem, it does become a problem when we are constantly bringing in new gadgets, books, clothes – yet nothing that we already have is purged. When you find yourself in a state of over abundance that takes on the look of a small flea market, it is time to put the breaks on the buying. The new year is a great time to purge and make the resolution that you will buy only what you need over what you want. Just because it is on sale doesn’t mean you need it. You will find that a little restraint will bring a huge sigh of relief when it comes to your wallet as well as your organizational endeavour. Tackling the clutter and organizing your home and garage is a process that doesn’t happen instantaneously. It will take time and some planning. Shelving can be used with labeled totes to maximize space, under the bed storage totes for bulky seasonal clothes and vacuum storage bags for other textiles. Each time a tote or storage bag is opened, take a moment and inventory the contents to see if items can be purged. If you make a regular schedule to de-clutter you will find it becomes much easier to streamline that part of your life. There will be items that you will not want to part with, especially if you are holding items for seasonal use, family members or business supplies. This is a perfect time to investigate off-site storage. Green Storage has 20+ different sized units, to facilitate your every need. Our friendly and qualified staff will work with you to provide expert advice. We even offer truck rentals and moving supplies. Our premises have 24/7 recorded video surveillance as well as a full site security system. The facilities are equipped with sprinkler systems and each aisle is equipped with adequate fire extinguishers. Our facilities are also a climate-controlled environment. Make an informed choice for your storage needs. Call us at Green Storage at 1 (844)-50-GREEN or visit one of our Ontario self-storage locations today! We are your dependable full-service, self-storage provider in Ontario and we look forward to assisting you! Make 2019 your year to get organized.